Following a very inconsistent showing in 2013, Benjamin’s Western Avenue Burger Bar is improving and things could be looking up for them as they enter into a warmer dining season. Recently I had a lunch meeting at Benjamin’s and was pleasantly surprised with my experience. I felt very welcomed upon arrival and the server was attentive to my beverage. Based on this, I’m very optimistic that they have addressed some service issues I’ve had. Plus. 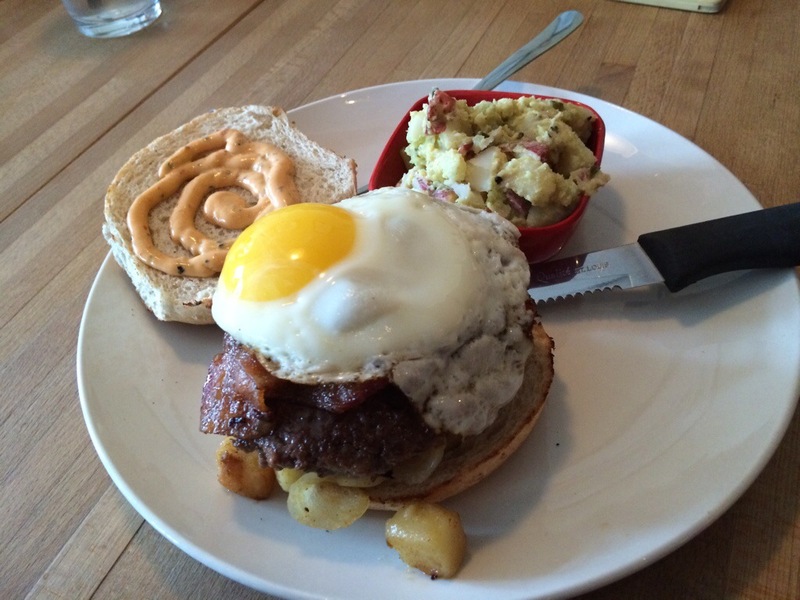 I got a burger that I had either overlooked or was new – the Burger dressed with Fried Egg, Bacon, Potatoes, Hot Sauce Mayo. I was immediately perplexed at the thought of how to get potatoes ON my burger. However, I had overthought the situation. The burger arrived with the potatoes under the burger which held them in place better. The egg was cooked beautifully though made for a slightly messy burger eating experience once you popped the yolk. The mess was totally worth it though. Hands down, this is now my favorite burger at Benjamin’s! Don’t be scared of the mayo, it’s spicy but nothing for spice-a-phones to worry about. Looking ahead to summer, I will be keeping Benjamin’s in mind for weekend brunch. I would expect their outdoor seating that will surely bode well for them attracting pre- and post-game Pirates fans. Especially considering parking on the nearby streets is free after 6:00 p.m.
Good Luck Benjamin’s! You haven’t won me over fully, but you’re making good progress. Now, just to await a side dish I can hang my hat on. I still can’t get on board with bleu cheese crumbles in my potato salad. Next Does Sushi Tomo have the best Sushi in Pittsburgh?